Monday, July 2, 2018 by 4:00 pm. I understand that my child may visit the Perry House, Stratford Public Library, and the cemetery adjacent to both. I will need to drop off my child at 9:30 am and pick up my child at 12:30 pm. Please list no more than three adults who can pick up your child from Colonial Kids at Perry House. Please include yourself, if you will be picking up your child. Please know that your child may only leave with these three adults listed, unless prior written permission is given by 10:00 am the day of pick up. Also note the adult may be asked to show ID. Please understand this is for the safety of all the children attending Perry House. Please include name, relationship to child and cell phone number. In the event of an emergency requiring medical attention, I hereby grant permission to a physician or other hospital personnel to administer treatment to my son/daughter. Every effort will be made to contact the parent/guardian so that specific authoriization can be acquired before medical treatment or hospitalization is administered. Additional information you feel we should be aware of regarding your child. The Perry House Foundation has my permission to use mine or my child's photograph publicaly to promote the Perry House. I understand that the images may be used in print publications, online publications, website and social media. I also understand that no royalty fee or other compensation shall become payable to me or my child by reason of such use. 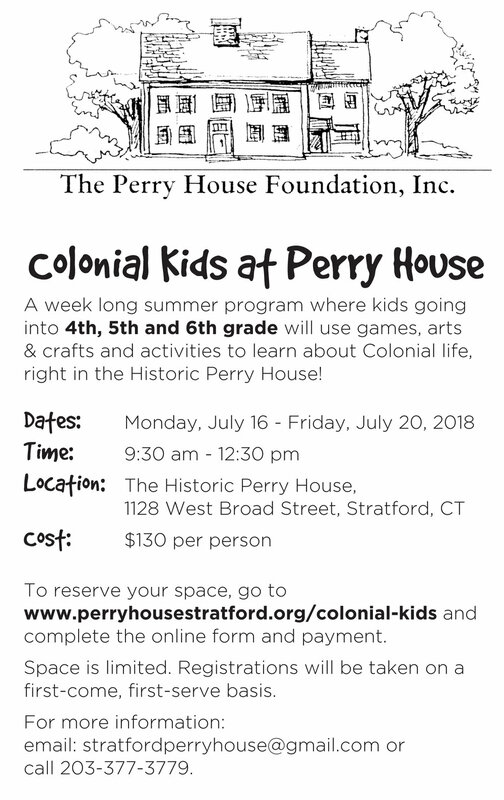 In order for the Colonial Kids at Perry House to be an outstanding experience which is both safe and fun, participants need to follow the policies below which include: • follow directions at all times • give turns and share with others • let the adults know of any problems before trying to resolve it yourslef • keep hands and feet to yourself at all times • use polite words in an appropriate voice • respect all property • clean up and keep area neat for others • accept consequences • no cell phones or any other electronic devices Additionally there will be zero tolerance for HITTING, MEAN BEHAVIOR, BULLYING, AND DISRESPECT. Clearly these rules will help ensure everyone involved with the program has a good time and positive experience in a safe and respectful environment. If a participant has trouble following the above rules, the particiapnt risks suspension from the program due to their behavior (no refunds will be given). To submit payment via credit card use the "Buy Now" link below. The experience will run from July 16-July 20 between the times of 9:30 am and 12:30 pm. The cost of this experience is $130. To reserve your spot, please complete all the required forms via the link below or download the pdf and drop it off to the Perry House on Saturdays between 9:00 am and 12:00 pm or by appointment. Students will have an understanding of what life was like during colonial times for kids. We will play colonial games and make a colonial craft. On this day the students will explore what life was like for Native Americans in Stratford. We will learn stories, look at maps and make a craft. School was very different for kids during colonial times. Kids will discover what school was like for children of the past through fun and interesting activities. There will be a field trip to the cemetery. We will learn about the important people of Stratford through the use of the cemetery. This is an opportunity for kids to show what they know. The beginning of the day will start with learning more about archaeology and anthropology. Then mark your calendars from 12:00-12:30 as we invite parents, grandparents and other friends to come see what is happening at the Perry House. The students will show off what they learned through artifacts and discussion. Light refreshments will be served. Every day students will have an opportunity for a snack. Please provide one for your colonial explorer. In consideration of others, please be sure it is peanut free. *The days are subject to change without notice due to unforeseen circumstances.